The Domesday entry for Thurgarton and Tythby records a priest and a church; evidence of a late Anglo-Saxon / early Norman church site was discovered in the 1950s during archaeological excavations on Castle Hill, 250m south of the present parish church. After 1066 Thurgarton passed to the Dayncourt family and in the 1130s Ralph Dayncourt founded the Augustinian Priory of St Peter. The early 13th century priory church built in the Early English Gothic style was said to have rivalled Southwell Minster in size and grandeur. Further work in the 14th century has left some beautiful examples of Decorated style carving. Thurgarton Priory accrued considerable wealth in the following centuries but was blighted by financial mismanagement and scandal; its reputation however was restored in the late 14th century by Walter Hilton, one of the great medieval spiritual teachers of England. The priory was surrendered to Henry VIII’s commissioners in 1538. The advowson and tithes were granted to Trinity College, Cambridge but the priory buildings and surrounding land were sold to William Cooper. The Coopers dismantled most of the church and claustral buildings to build a Tudor mansion. The priory church continued as the parish church but as a much smaller building which retained only the north-west tower and the west end of the nave with a lowered roof. In 1777 the Tudor house was replaced by the brick Georgian mansion one can see today. In 1820 the Milward family bought the Cooper estate and in 1853 Richard Milward commissioned the Nottingham architect, T C Hine, to restore the dilapidated church. 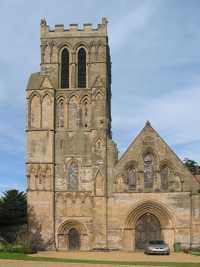 The present church is essentially Hine’s work together with surviving fabric from the 13th and 14th century building and retains its ancient title of The Priory Church of St Peter.